Leeds United ended their 10-match winless run with victory over Brentford to boost their play-off hopes. Liam Cooper headed the hosts into the lead from Ezgjan Alioski's free-kick. Pierre-Michel Lasogga nearly scored a second when his shot beat goalkeeper Dan Bentley but Ryan Woods cleared off the line. Bees defender John Egan had forced a fine save from home keeper Felix Wiedwald before Cooper's goal but the visitors rarely threatened thereafter. 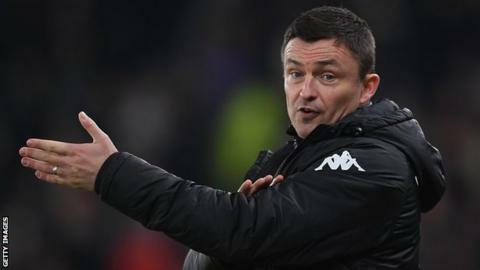 It was Leeds' first win under Paul Heckingbottom, their previous success having come at Burton on Boxing Day under previous head coach Thomas Christiansen. They had come within seconds of claiming victory at Derby on Wednesday before conceding a late equaliser, but never looked likely to suffer a similar disappointment after Cooper headed in his first goal of the season. Alioski felt he should have had a penalty in the second half when he went down under a challenge from Yoann Barbet, but the referee was unmoved, while Woods did well to clear Lasogga's shot off the line as Leeds pressed for a second. Heckingbottom's men are now 11th, five points off the play-offs, with Brentford a point and a place better off. "It's good to have the first win, it is a reward for the hard work of the players. able to defend and stop teams as well as hurt teams. "We had chances to get the second and close the game out and that is an area where we will need to be better." "It looked like it was going to be one way traffic, but then the Leeds goal comes from an offside position. "We should have had a penalty when Neal Maupay gets thrown to the ground. You want the big decisions to go your way, but they didn't today. "We were too sloppy on the ball and the subs didn't work today. We were very poor on the ball, certainly in the second half." Match ends, Leeds United 1, Brentford 0. Second Half ends, Leeds United 1, Brentford 0. Foul by Emiliano Marcondes (Brentford). Substitution, Leeds United. Ronaldo Vieira replaces Samuel Sáiz. Foul by Hadi Sacko (Leeds United). Offside, Leeds United. Kalvin Phillips tries a through ball, but Caleb Ekuban is caught offside. Attempt missed. Sergi Canos (Brentford) right footed shot from the right side of the box is high and wide to the right following a set piece situation. Attempt saved. Alan Judge (Brentford) right footed shot from outside the box is saved in the centre of the goal. Emiliano Marcondes (Brentford) wins a free kick in the attacking half. Foul by Pontus Jansson (Leeds United). Corner, Leeds United. Conceded by Yoann Barbet. Substitution, Leeds United. Hadi Sacko replaces Stuart Dallas. Attempt missed. Neal Maupay (Brentford) right footed shot from outside the box is too high. Assisted by Emiliano Marcondes. Yoann Barbet (Brentford) is shown the yellow card for a bad foul. Samuel Sáiz (Leeds United) wins a free kick in the attacking half. Corner, Leeds United. Conceded by John Egan. Substitution, Leeds United. Caleb Ekuban replaces Pierre-Michel Lasogga. John Egan (Brentford) is shown the yellow card for a bad foul. Foul by John Egan (Brentford). Samuel Sáiz (Leeds United) wins a free kick in the defensive half. Offside, Brentford. Ryan Woods tries a through ball, but Neal Maupay is caught offside. Substitution, Brentford. Emiliano Marcondes replaces Kamohelo Mokotjo. Substitution, Brentford. Alan Judge replaces Romaine Sawyers. Offside, Leeds United. Felix Wiedwald tries a through ball, but Pierre-Michel Lasogga is caught offside. Corner, Brentford. Conceded by Eunan O'Kane. Attempt saved. Kalvin Phillips (Leeds United) right footed shot from outside the box is saved in the centre of the goal. Assisted by Samuel Sáiz. Offside, Leeds United. Liam Cooper tries a through ball, but Pontus Jansson is caught offside. Eunan O'Kane (Leeds United) wins a free kick in the defensive half. Attempt blocked. Pierre-Michel Lasogga (Leeds United) right footed shot from the centre of the box is blocked. Assisted by Samuel Sáiz. Sergi Canos (Brentford) wins a free kick in the defensive half. Foul by Gaetano Berardi (Leeds United). Corner, Leeds United. Conceded by Andreas Bjelland. Corner, Brentford. Conceded by Liam Cooper. Substitution, Brentford. Sergi Canos replaces Ollie Watkins.